"As a fine art photographer, I try to create photographs that go beyond being pictorial or realistic. A fine art photograph is made up of three parts: the object captured, the psyche of the photographer, and metaphor. Every photographer stamps his psyche on his work. This can be as simple as how he frames the photograph, or as complex as how he chooses to post-process and present the image. I believe a photograph must transcend the initial capture. A fine art photograph should show the viewer something about the object captured that is new. Even more importantly, a fine art photographer must stimulate emotion in the viewer. Some of my photographs are entirely about emotion and have little to do with a physical object. Photographic metaphor means that certain elements in the photograph stand for or suggest something else. For example, the black skies in many of my monochrome photographs are a metaphor for mystery or non-reality. A fine art photographer strives to show all of these truths combined into a whole. When successful, something greater is achieved, something the viewer may not have before seen or felt." "I studied photography at Purdue University under Steve Rose. Afterwards, I became an advertising photographer and had my own fine art gallery in Indianapolis, Indiana. I’ve always gravitated to fine art photography, my early influences were photographers like Adams, Weston, Cartier-Bresson and Eugene Smith. I love the big dark landscapes created by Adams and the intimate journalism of Cartier-Bresson. Later I became aware of Jerry Ulsemann and his wonderful multiple image photographs. By combining elements from more than one capture into a single image, or collage, Ulsemann is able to generate his own reality, and in so doing, shows us something more of ourselves." "My own style evolved from these influences, and then was fused with the vibrant colors of advertising photography. Whether in black and white or color, I love strong saturation, geometric spaces and simplicity of expression. I see no need to reproduce reality. My work often utilizes multiple unrelated elements combined into subtle new images. I use extensive post-processing to expand on the color pallet and produce entirely new special effects. I recently spent time in France photographing areas frequented by the Impressionist painters of the nineteenth century. Here one senses a continuity of thought moving from the past into the present. The techniques of impressionists such as Van Gogh, and synthesists such as Paul Gauguin, can be incorporated into our digital age. I believe the past always influences the present." "Photography is a journey, through place and time and thought. I hope you enjoy the ride." "My family moved to South Africa when I was a child and I spent the next 20 years there, growing up, getting married and having two children. We moved to America in 1993 and once the kids were at college we moved to Longboat Key where we have been for the last 6 years. It is here that I began my creative journey." "I have always seen beauty in things that are old or discarded and I can often picture them as something more. Re-purposing and recycling items is a lot of fun. I am a mixed media artist – which really means that I use many different mediums and create many different kinds of art. Whether I am creating a whimsical character from papier-mâché and paper clay, or re-purposing and altering a vintage form, or putting together a found object assemblage, I love the freedom that these different mediums give me, and to see how they evolve from nothing into something." Drawing and painting have been a part of my life from early childhood in Buffalo, NY. I entered Syracuse University as a liberal arts major. But within a year, I talked my way into taking classes in both the art school and school of architecture. Fortunate to have gone to college in an age when experimentation was encouraged (You did not have to know you were going to be a brain surgeon as a 7-year-old! ), I soon found my love for the visual arts overwhelming and before I knew it my portfolio was accepted at Syracuse University’s College of Visual and Performing Arts. While an S.U. student, I was able to study painting for a semester overseas at the Sir John Cass School of Art in London, finishing the semester’s studies in Paris.... then traveling throughout Europe... more broadening experiences. I had many wonderful teachers in all the visual and graphic arts classes but especially with the painter Jerome Witkin. I’ve been fortunate throughout my career to be able to paint for self-expression and design as a creative director for advertising while living in Soho in NYC. Each discipline fed the other. While working by day I went to NYU for my master’s degree at night to learn film/video production and at the same time painting and showing in New York. Again, I was fortunate to have a painting teacher who was challenging and encouraging – the pop artist Idelle Weber. My paintings have been categorized as representational (which they are) but they are planned and constructed in many ways similar to old masters, abstract expressionists, and modernists. Dana Clark started carving wood at Milburn High School, New Jersey. He sold his first piece to the Paper Mill Play House in 1970. Dana studied art at USF, MCC, Ringling School of Art in 1983, and understudied with many individual artists. He works with clay, stone, wood, steel, and aluminum. Dana worked with clay and wood for many years and graduated to alabaster and marble at Ringling School of Art. Dana’s major focus has always been the surreal and abstract. He started exploring figurative surrealism with clay in the late 70s and has returned to this side of himself recently. Jacqueline Clark FWS, PWS, NWS, FSWS, PP is an artist always in pursuit of the essence. After a thorough grounding in sculpture and years of concentration on oil painting, she discovered the joyful spontaneity of watercolor and has focused her efforts in that medium ever since. Her early recognition and awards came for her oils and sculpture. Without the understanding of structure learned there, mastery of watercolor would still be beyond her. Now, as her watercolor technique matures through practice, experimentation, and instruction, her fascination with the medium and control of the finished product becomes ever more sure. She has studied with many of this country's prominent watercolorists in workshops and symposia in the USA, as well as abroad, to renew and recharge her commitment to a demanding medium. Jacquie taught watercolor and all media painting at Sarasota and Manatee Adult & Community Education for many years. Jacquie explains, "I started using watercolor for the ease; no mess, no smell, so I could just add water and it dried so quickly. I have always been attracted to flowers and feel that watercolor captures the fragility of the flower's essence. This medium can be the most relaxing, fun and spiritually satisfying. When I paint there is no time or space, only a feeling of pure joy. I never tire of it. I have visited many museums all over the world and felt the excitement art can bring. I want each of my works to bring that same feeling to the viewer." Liz Cole’s entire professional career as a Professor of Art focused on the artistic and aesthetic development of young children. A nationally-recognized expert on this topic, she co-founded the Toledo Museum of Art’s early childhood program in 1978, which remains a cornerstone for the Museum’s education division. Her work in mixed media allows her to stretch the artistic response through rich surfaces of paint and materials. All this evolved through her many years in the academic world. Liz’s fascination with “writing” in color and line is strongly rooted in her intense interest and research into the mark makings that are part of our developmental process. "From the early scribbles of childhood to the use of combined lines to communicate through handwriting, we all are telling stories whether obvious or obscure. Likewise, color and emotion are closely linked and evoke reactions, memories, and attitudes that are personal to our own stories." "My love of texture is endless, whether it be in fabric, textile fibers, nature....it’s all around us. When pattern and color are woven, they meld together becoming one again and I’m inspired by their depth and beauty. I’m most happy when creating new designs and most excited when I see something totally unrelated and I’m able to transform that object or idea into my art." "Growing up in an artistic family, I learned to see beyond two dimensions and a life of fantasy and creativity surrounded me. I believe we all have a capacity to connect with our inner selves and find that wrinkle, that obscure place where nothing can stop us! My interest in textiles and design began at an early age. It seemed only natural that I should pursue an art degree and I chose Interior Design. During that time, I learned many art forms and weaving but textiles became my favorite. After receiving a B.A. from Russell Sage College in New York and owning my own interiors business for several years, I realized I was missing that creative time alone. So now I’m back to doing what I love most. Whether you’re looking for a dramatic, formal look or fun and funky, I have it!" "Another passion of mine is rescuing retired racing greyhounds. When purchasing a pillow, purse or wall art, you will also be helping a much exploited breed find a better life. A portion of my profits go directly to finding greyhounds loving homes. Living in beautiful Sarasota, Florida is very inspiring - an artist’s paradise. I reside here with my husband and two wonderful greyhounds." Lisa began her journey into the world of jewelry with a passion for beading and then expanded her work to include wirework, chain maille and metalsmithing. Her inspiration comes from two of her lifelong loves, art and nature. Lisa’s jewelry line, HummingBeads, emulates the magical and striking color combinations that are displayed by the hummingbird and its flowers and habitats. In her metal work, Lisa explores the fascinating versatility of metal and its ability to demonstrate the organic and fluid qualities that are found in nature. Through these inspirations, Lisa creates one of a kind artistic treasures that are whimsical, ethnic, a little funky, elegant and unusual. Her collections are composed of sterling silver wire and plate, unique beads from around the world, semiprecious and natural stones and found objects. Lisa has been making jewelry for the last five years. She has participated in many local and home shows and worked with several nonprofit organizations to help raise funds for her special causes through the sale of her jewelry. She continues her education in metalsmithing at Art Center Manatee and takes advantage of local and national jewelry workshops whenever possible. Lisa is thrilled to be pursuing her second career as a jewelry artist and to be an artist member of Art Uptown. "A professional artist since 1964, I attended Harris Institute of Art in Nashville and later went on to study at the Atlanta College of Art. I have studied under such renowned artists as Joseph Perrin (Atlanta, Georgia) and Wolf Kahn (Sebasco, Maine), and have been teaching various art forms to other artists and students since 1970. I have held many leadership positions in the art community such as the Vice President, local chapter of the National Women’s Caucus for the Arts: President, Petticoat Painters; President, Florida Suncoast Watercolor Society; and Area Chairman, Florida Artist Group, Inc. and won numerous awards for my art, including the prestigious Fonchen Lord Memorial Award, Jacksonville Museum of Contemporary Art, juried by David Levy, Director of the Corcoran Gallery of Art, Washington, D.C."
"My teaching experience includes teaching pottery, book making, mono types, and painting (watercolors and acrylics), having taught such groups as teachers, other professional artists, and the general public. Some of my teaching experience includes teaching continuing education classes at Oglethorpe University (Atlanta, Georgia); teaching recertification classes at Holy Innocence Episcopal School (Atlanta, Georgia); and teaching at a retreat for the Women’s Contemporary Artists (Ellenton, Florida). I have also juried numerous art exhibits throughout Florida." "My paintings are exhibited in corporate and private collections in Georgia, Florida, New York, Hawaii, Maine, Switzerland, and Venezuela. I currently exhibit in my Main Street Studio located in the heart of the art district in Sarasota, Florida." James was born in Minneapolis Minnesota and now lives most of the year in Anna Maria Florida. He is a sculptor and has had a passion for three dimensions all his life. James graduated from Colorado College in Colorado Springs, Colorado with a Degree in Fine Art. However, throughout most of his adult life his creativity was channeled into a career as a retail entrepreneur. Late in 2008, with the sale of his businesses, and he and his wife, Barb, becoming empty nesters, James took the opportunity to return to his passion. James’ works have won awards in Minnesota, Florida and New York. "I create art to lift and enlighten the spirit, to touch the heart, to awaken the intellect; to be provocative, that is, to provoke the mind, heart or spirit to experience something new or rekindle something forgotten. I believe art should be beautiful. Its proportion, balance, and aesthetics should draw the heart and spirit into it and leave with something more. I strive for my art to be a unique contribution to our collective understanding of humankind." Esther K. Jensen was born on the west coast of Denmark, close to the North Sea. After moving to the US, she spent most of her life in Atlanta, Georgia, and moved to Florida in 1998. She has always had a keen interest in glass, and in 1995, while in Denmark, was introduced to Else Willumsen, a renowned Danish glass artist. That year and for 4 consecutive years, she attended glass fusing courses and finally set up her own glass studio in Boca Grande, Florida. There she is still a member of the Boca Grande Art Alliance, where she participates in several exhibits every year. In particular, she is one of the founding members of the "Five Women Show," which takes place every year in February. 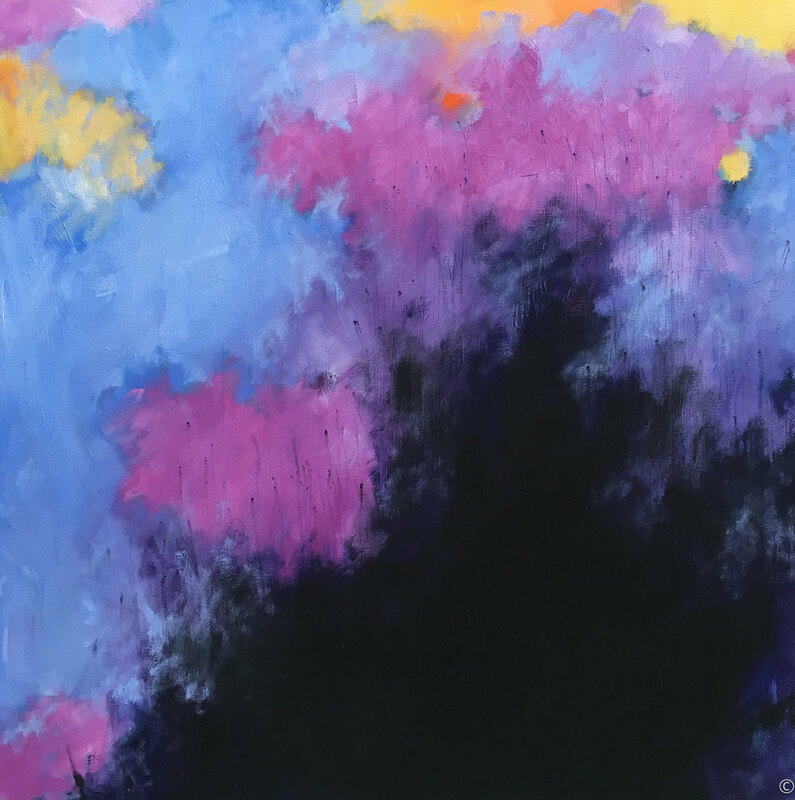 Jensen's work is very inspired by her proximity to the Gulf of Mexico, using colors and shapes kindled by the beaches and fauna of the west coast of Florida. Jensen is an exhibiting member of the Boca Grande Art Alliance, and a member of the Sun Coast Glass Guild. "I have been designing, illustrating, painting and writing most of my life; bringing bits and pieces, fragments of my thoughts, observations, fears, hopes and dreams into each piece of my art. My work is an expression of my travels along life's path. It is a path sometimes complicated and frequently a challenging journey of love. Being able to share my work with people from all over the country and the world brings me immense joy. I am so lucky to wake up each morning and spend my day doing what I love!" Dion Kurczek’s fluid abstract paintings have been likened to “a melting Caravaggio”. Dion works with colorful, blended inks to produce dramatic compositions that emphasize stark contrasts of lights against darks, and a proliferation of intricate details. Dion’s path as an artist took a decisive turn in the early 2000’s, while he was admiring a red abstract painting at a local art walk in Chicago. Among the many abstract paintings he saw in the walk, this particular one made an imprint in his mind. He wondered, “what qualities make one abstract painting appealing, hooking the viewer into a lingering examination of the work, and another one mundane and forgettable?” He decided to investigate this question, which led to a prolonged journey of self-study, coupled with personal instruction under successful abstract painters he admired, including Maxine Masterfield and Cody Hooper. He soon gravitated toward acrylic inks, intrigued by the amazingly detailed forms they produced when blended together. Mastering the inks was challenging, but over the years Dion has developed a number of techniques to capture the wonderful patterns that he helps orchestrate and coax from the mingling liquids. More recently, Dion has introduced other components into his process, including epoxy resin, and silicone oil, in his continuing experimentation in this fascinating fluid medium. Maro grew up in Bellport, a beautiful waterfront village on eastern Long Island. As a child she enjoyed exploring the woods and sailing her small boat across the bay to a natural barrier island. Her appreciation of wild places grew throughout her life and has always been evident in her paintings. After graduating from Brown University, she lived many years in the Colorado Rockies. She showed and sold her work in state-wide exhibitions, which led to membership in the Colorado Watercolor Society. Since moving to Florida in 1999, her favorite mediums have been collage and acrylic. One of the first things to captivate her about Florida's west coast was the wildness of the many natural beach access paths, which inspired a collage series. From there, the theme of her paintings emerged from the paths, to the beach, and then beyond, out onto the water. Sometimes, as she paints, her imagination and memories take her back to shore, into the woods or the mountains. Many of her abstract acrylics can be seen and felt in more than one way, but, always, there is the sense of awe she feels for the natural world. Janet Mishner received a BA in Art Education from University of Maryland, with postgraduate classes at the Maryland Institute College of Art and Towson University. She studied painting for many years with distinguished Maryland artist, the late Gladys Goldstein. Her work was featured in numerous solo shows, galleries and private collections in Baltimore. Since moving to Florida in 2002, she continues to participate in national and locally juried shows as a member of the Women’s Caucus for Art, Florida Artists Group, Inc., Women Contemporary Artists and Petticoat Painters. Her work is in several public collections including the U.S. Embassy in Manilla, Goldberg, Rosenstein & Khan, Pa, Lakewood Ranch Medical Center, Florida Cancer Specialists, and Kaizen Total Wellness Center. “Mixed media work allows me to indulge in my two favorite subjects: Psychology and Art. I am fascinated by meanings and strive to express through color, pattern and form. In my current series, 'Floral Arrangements', I enjoy mixing patterns and challenging the boundary between "frame" and subject matter. Other times, I begin in an automatic way, allowing for unconscious decisions and then looking for meaning. Either way, the finished work represents something felt, not observed." "My work speaks to the power of nature, providing the means to life. The influence of the elements of air, wind and fire are presented in the images of the exhibition. Their life-giving forces are symbolized in the trees and plant life that give us the air that we breathe." Cecile Moran has been a teaching artist for many years, including 2 years in Spain. Her painting is allegorical in nature and relies strongly on the interaction of brightly colored images to project the story. These images are based on personal experiences. She received a Bachelor of Fine Arts from Boston University College of Fine Art and a Master of Arts in Art Education from California State University at Long Beach. Additional study was provided by scholarship to the School of the Museum of Fine Arts, Boston and Wildacres Workshop in North Carolina through the Ringling School of Art and Design. Her work is found in numerous private collections and has been exhibited in Massachusetts, California, New York and Florida. "My paintings have a unique appearance due to the layering technique used in the process. Layers of color are placed one over the other and then removed in some areas to reveal new color relationships. I have been impressed with the layering of color in the Molas of the San Blas Indians. The process used in my work indicates this influence." Evelyn is originally from New Jersey and Delaware, and has now lived in the Sarasota/Manatee County area of Florida for over 25 years.She received a Bachelors Degree from the University of Delaware and has attended The Pennsylvania Academy of Fine Arts and Ringling College of Art and Design. In 1984, Evelyn began exploring the world, visiting 48 of the 50 states as a scenic artist with Ringling Brothers, Barnum & Bailey Circus. She continues to explore the country through the educational and conservation efforts of Haai, Inc. Shark Encounter, the family business. Evelyn’s travels throughout the United States, Europe, Mexico and Canada along with a year residency in Japan have shown a wide diversity of life and given her the opportunity to share her experiences through art. In 2007, Evelyn adopted a nine year old Boxer female named Tilly through Florida Boxer Rescue. She wanted to help this wonderful organization but realized she would be a “Foster Flunky,” keeping any Boxer in search of a “furever” home, so she decided to help them through her art. Evelyn donates her work to rescues and shelters around the country to raise funds that directly help animals in need and their caretakers. Her dog portraits have recently been published in 1000 Dog Portraits - From the People Who Love Them. Evelyn’s work is held in private collections throughout the US, Canada, Australia, France, Spain and the Netherlands. Evelyn is a member of The Petticoat Painters, one of the oldest, continuously exhibiting women’s art groups in the United States. She serves on the governing board of Myakka River State Park with a dedication to bring artists and nature together. She has been awarded fellowships and residencies from the Jentel Foundation, Brush Creek Foundation for the Arts, Dorland Mountain Arts Colony, Zion National Park and Weir Farm National Historic Site. Evelyn shares her 12-acre home Barking Dog Ranch, with her husband Philip, two dogs, visiting horses, sharks, and the occasional sea lion visiting from next door. Her life is a menagerie of the people, places and happenings of a distinctive south Florida experience. "My work evolves from a lifelong fascination with and dedication to the natural environment. I create to express my commitment to the preservation of our native flora and fauna, to celebrate its diversity and document its fragility. As a painter I derive inspiration from the environment. As an artist I have the opportunity to record the world in a manner distinctive to my experience. This process advances the artistic language of my work as well as expands the conversation and consideration for the environment and animal welfare among my viewers." A Fourth Generation Artist, Leigh O'Rourke grew up in Memphis, Tennessee and moved to Sarasota twelve years ago Her formal education includes Rhodes College, SMU and the University of Texas. In Memphis, O’Rourke studied art with Kaye Spruill, John Travino and Marilyn Wannamaker. She exhibited in multiple galleries and shows including the Paul Edelstein Gallery, the Fountain Gallery and Harrington Brown Gallery. After moving to Sarasota twelve years ago, she continued her work in oil and acrylics. Laura is a mixed-media artist living in Sarasota, FL. She has been an artist her entire life, beginning in second grade with a drawing of Popeye. She has explored many mediums, including silk screening, gourd crafting and watercolor painting, until arriving at her current explorations of mixed-media abstract. She attended Missouri University before receiving a Bachelor of Arts in Education at Webster University, St. Louis. She taught art in a middle school before settling in at Nerinx Hall, a private girl’s high school, both in Webster Groves MO, while she was also raising seven children with all their complexities and delights. From St. Louis MO, then Grand Lake CO, Laura moved to Sarasota in 1999 as a watercolor painter. While attending a collage painting workshop in Venice Italy in 2007, she became captivated by the wide-open possibilities the medium offered. She has a passion for color, layering, and experimenting with various mediums. Her work has won numerous awards, locally and including an honorary in Art Uptown Gallery’s Dog Days exhibit in 2016. Her artwork is in collections nationally, in California, Washington, Oregon, Colorado, Missouri, Pennsylvania, New York and Florida. Born in Western Pennsylvania, Dan Reeves has been involved with art and music all of his life. He holds a Ph.D. from Illinois State University where he studied visual perception and its relationship to art and aesthetics. He has taught at Illinois State University, Ball State University, Wright State University, Virginia Commonwealth University and Arkansas State University. At VCU, he held various posts as professor of art, art department chair, music department chair, director of international studies and associate dean of fine arts. He has worked as an art consultant and has served in editorial and graphic designer capacities. His work has been published in the fields of art, art education, visual perception and aesthetics. He has served in numerous professional capacities such as Dean, Art Department Chair, Music Department Chair, Director of Graduate studies and Executive Director of International Education. Most recently, he served as Dean of the College of Fine Arts at Arkansas State University from 2000 to 2012, which included the Departments of Art, Music and Theatre as well as Fowler Center for performing arts, and Bradbury Museum, the largest art museum in Northeast Arkansas. Watercolor is Rita's passion - for it's translucence, spontaneity and proclivity to create unintended results. Her subject may be anything interestingly illuminated, because it's all about the quality of light. She captures the beauty that surrounds us, but is so often overlooked in our fast-paced lives. Rita grew up in Kettering, Ohio and Wyckoff, NJ. She attended Franklin & Marshall College in Lancaster, PA and graduated from Georgetown University, spending 11 years working in New York in graphic art, primarily in publishing. Rita is a signature member and past president of the Florida Suncoast Watercolor Society, past president (twice) of Art Uptown Gallery, and has exhibited and won numerous awards throughout Florida. Her work is widely held in corporate and private collections. Born in Guatemala, Central America, Patricia Sorg is a painter who has mastered various media and created a style all her own, emphasizing the deep and vibrant colors of her native country. Her avid, painterly approach has won her many awards along the way. She has been painting for 35 years and has held numerous expositions at galleries and museums including the Guatemalan Museum of Contemporary Art, Museo Ixchel, and art galleries in St. Lucia, Guatemala City and Sarasota, Florida. Gillian St. George began her art studies in England and since moving to Florida in 1980 has been the owner of businesses in Portrait & Wedding Photography, Picture Framing and an Art Gallery. Gillian's artwork offers bold unique shapes, vibrant colors and connecting designs that evolve from a technique of multi layering, revealing an isolation that conveys a human transformation. "My challenge is to apply BALANCE between the opposing but complementary aspects of nature. To take my natural tendency of planning and organization, yet reconcile it with a spontaneous and intuitive layering of color. Through use of exciting color combinations, expressed via intriguing design, I challenge my artwork to inspire the viewer with a longing. Whether it be a replenishing calm, or joyful invigorating entertainment I wish to offer a focused respite and a powerful promise of elevation from the routines of daily life." Gillian's work is widely held in private collections in the USA & Europe in both realism and abstract work. She has taught students in watercolor and acrylic, and still enjoys taking workshops herself with well known artists, to stay abreast of new applications and products. She has received numerous awards for her work and continues to exhibit throughout Florida. Follow Gillian on Instagram HERE to see work in progress. Sharon Stewart is an award winning, nationally collected artist working abstractly with mixed media on canvas and three dimensional collage. She was raised in Michigan and currently resides full time in Sarasota, Florida. A great deal of the art she creates is done on a commission basis. A request from a client will result in a home consultation, custom design and individual color choices. Room enhancement is always her priority. All pieces are uniquely original and never exactly the same. Exotic papers, found objects and various water media are blended together, resulting in works that reflect her quest for serenity, tranquility, peace and beauty. "I love to create something that catches the eye as you enter a room and makes you stop, look, then move closer to experience the richness of the composition." “My favorite subject is marines, especially coral reef scenes. The living reef never fails to inspire me. Underwater is a world of wonder, beauty, life, color and mystery. But the coral reef is probably the most threatened ecosystem on our planet." William Swanson studied art in Philadelphia at both The Pennsylvania Academy of the Fine Arts and Fleisher Art Memorial. His paintings have been in many open juried exhibits and won awards in Florida and Pennsylvania. His website is williamrichardswanson.com. A native Brazilian, Elisabeth Trostli moved to New York in 1961. She received her artistic education at the prestigious Rhode Island School of Design, majoring in Illustration, attaining a BFA’72 and MAE in ’76. In 1981, Elisabeth Trostli established herself as a successful free-lance commercial artist and designer serving the jewelry, advertising, stationery and giftware industries located in Providence, RI. In 2011, Elisabeth Trostli relocated to Sarasota, Florida. In this gorgeous cultural, cosmopolitan city, Elisabeth has truly unleashed her creativity. She works as a digital painter, bringing creative ideas and imaginings to life using modern tools of technology. Adobe Photoshop computer software is skillfully used to blend Elisabeth Trostli’s own original hand-rendered illustrations, antique papers, exquisite embellishments, photography and geometrical fractals in a multi-layered unique collage format that is both decorative and meaningful. Her digital paintings are available printed and mounted on gallery-wrapped canvas, and/or archival paper, greeting cards and even on fabric. Painting bold, realistic landscapes, seascapes and still lifes is Marlane Wurzbach’s passion. Her bright, colorful acrylic paintings are all meant to cheer the viewer, offering a "visual vacation" with a colorful palette, sharp focus and attention to detail. Marlane grew up in Westchester County, New York, enjoying summers on Long Island Sound and as much of the school year as possible in art classes at Rye Country Day School. After Centenary College and Berkeley Secretarial School, she worked at PepsiCo for the CEO where one of her favorite jobs was to give tours of PepsiCo’s extensive Donald M. Kendall sculpture garden. Moving to Manhattan after marriage, she got a degree from NY School of Interior Design and worked in that field for several years. Living in Greenwich CT for three decades offered Marlane a series of paid and volunteer endeavors, all of which revolved around some aspect of artistic expression and a desire to try new artistic mediums. In 2005, Marlane and her husband moved to the Gulf Coast of Florida, and she was able to focus on painting and working with other local artists to promote the area's vibrant artists' community. She has been pleased to win a number of local painting awards, and her work is in private collections in the United States and abroad. Kathy Wright is a visual artist based in Sarasota, Florida. With a Bachelors Degree in Architecture from Georgia Institute of Technology, Kathy went on to obtain a Masters Degree in Architecture from Harvard University's Graduate School of Design. Before taking up painting full time, Wright worked for several world renowned architects including Zaha Hadid Architects in London and Mack Scogin Merrill Elam Architects in Atlanta. Kathy has received numerous awards for her work including an Individual Artist Grant from the Pollock-Krasner Foundation for painting and a Knight Neighborhood Challenge Grant from the John S. and James L. Knight Foundation for sculpture. Among other honors, Wright has participated in the Art in Embassies Program of the United States Department of State, Sophia, Bulgaria and was Artist in Residence in Everglades National Park in 2008/2009.